Many of us hear the call to heal within and serve humanity in our outward actions, thoughts and deeds – but some feel the call so strongly they have to do something about it. They are not willing to stand by and idly watch as the planet continues to be mis-used and abused. Yet, all around this amazing planet people are getting together in small groups to talk, meditate and take action. This month the STREETteam had the opportunity to participate in a “Marry the Earth” ceremony that took place in Middle Tennessee at a central location for three major cities : Knoxville, Nashville and Chattanooga. The event took place the afternoon of May 15th, 2011 – a wonderfully chilly and incredibly foggy day in the mountains of Tennessee. I'm Dawn, the Good News Muse. Welcome to "Imagine the Shift" where I hope you'll be inspired to engage more fully with your journey and in so doing conspire to create a world that works better for everyone. What shift? To me, the shift is internal and external while framed in the context of a larger historical shift. I believe we're here to return the heart to the planet and its people, thus the internal shift involves living from a place of love, a love that's courageous, thoughtful and open, rather than reacting in fear. 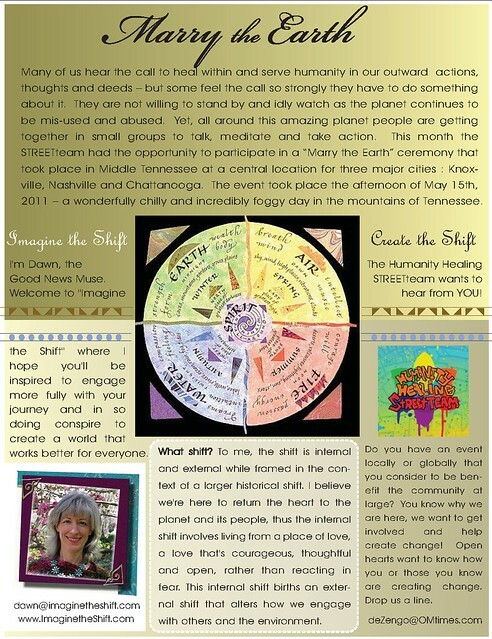 This internal shift births an external shift that alters how we engage with others and the environment. Each of the elements had a special ceremony that not only educated, but brought us together as a group as we explored the connection between us and our beloved planet. We began with mother earth and the mathematical patterns that can be discovered on the macro & micro level with Marian Farrior. Each group was given a back of natures’ goodies to explore and discover any secrets that patterns offer. Patterns of: perfection, packing & cracking, branching, fractals, growth, flow. As promised, by the time each group member had spent a few minutes investigating the pieces of nature given – we were unable to ever look at nature the same. We walked away with a new appreciation for natural patterns and the mysteries each possess. To celebrate our life giving water, one of the guest speaker’s discussed several events that she had participated in and the changes that were occurring and had been sufficiently and scientifically monitored to verify if groups of like minded people praying and meditating, chanting and singing could actually change the toxic levels of the water and reserve contamination. We were given an opportunity to bless a portion of water and then unite our individual water with that of the group! At the end of the day, we were each given a portion of the water back in a delicate little mason jar, so that we could connect the blessed water with the watersheds in our own area. Our group was incredibly open as well as vocal, so when the gift of sound arrived there was no hesitation, as all were delighted to participate. Words are power, as we have been taught by the ancient ones. 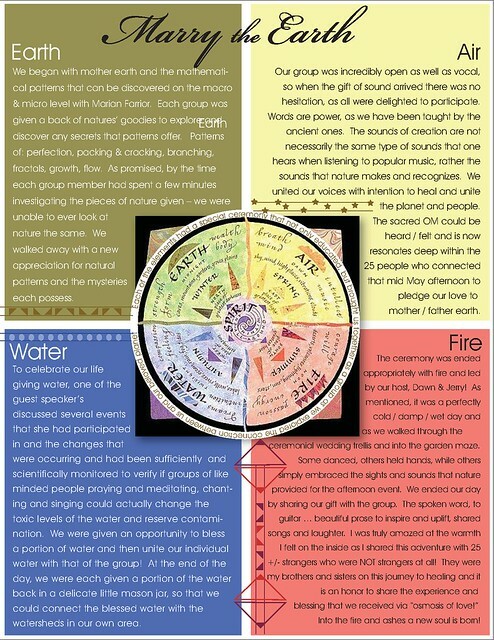 The sounds of creation are not necessarily the same type of sounds that one hears when listening to popular music, rather the sounds that nature makes and recognizes. We united our voices with intention to heal and unite the planet and people. The sacred OM could be heard / felt and is now resonates deep within the 25 people who connected that mid May afternoon to pledge our love to mother / father earth. The ceremony was ended appropriately with fire and led by our host, Dawn & Jerry! As mentioned, it was a perfectly cold / damp / wet day and as we walked through the ceremonial wedding trellis and into the garden maze. Some danced, others held hands, while others simply embraced the sights and sounds that nature provided for the afternoon event. We ended our day by sharing our gift with the group. The spoken word, to guitar … beautiful prose to inspire and uplift, shared songs and laughter. I was truly amazed at the warmth I felt on the inside as I shared this adventure with 25 +/- strangers who were NOT strangers at all! They were my brothers and sisters on this journey to healing and it is an honor to share the experience and blessing that we received by “osmosis!” Into the fire and ashes a new soul is born! This coincides with the EARTH section and what we were exploring.